If you want to be truly comfortable reading the New Testament in Greek, it helps to immerse yourself in the language as much as possible. Of course, Koine Greek is not a living language, which makes immersive learning approaches much more difficult (if not impossible). Although it’s a comparably poor substitute to interacting with live speakers, I found that listening to audio recordings of the Greek NT helped improve my pronunciation, vocabulary acquisition, and generally helped me understand the rhythm and flow of Greek as a spoken language. Since Koine Greek is not a living language, different pronunciation systems have developed over time. Before you begin memorizing vocabulary and reading your Greek New Testament, you’ll need to pick one pronunciation and stick with it. Depending on what introductory Greek grammar you use, it may or may not thoroughly explain the various pronunciations. So I’ve briefly outlined the three most common below for you. I’ve provided links with the basics for each, and listed NT audio recordings as well. This is the most common pronunciation, especially in seminaries and universities. Most textbooks will use this as the standard, and may only mention alternate options. Erasmian is used for its teaching value, as it allows a student to hear each individual sound distinctly and consequently helps spelling accuracy. That said, it’s not the pronunciation you want to use if you plan on learning modern Greek at some point, which sounds completely different. The primary reason why people use this pronunciation is because that’s what their professor and colleagues use. Erasmian Pronunciation Basics: This page is a great summary of the Erasmian pronunciation with audio files. There’s also several links to additional resources near the bottom. Erasmian Vocabulary Practice: Zondervan has two different CDs available to help practice the pronunciation of vocabulary, Basics of Biblical Greek Vocabulary and New Testament Greek Vocabulary (Learn on the Go). Erasmian NT Recordings: Although it only has selected readings from the New Testament, Readings in the Greek New Testament by Jonathan T. Pennington offers a good cross-section of the NT, and will allow you to hear larger portions of scripture outside of just vocabulary words in an Erasmian pronunciation. Reconstructed Koine Pronunciation Basics: Here’s an explanation of how Reconstructed Koine differs with Erasmian, with several links and alphabet audio files. For someone who wants a rather in-depth explanation on the particulars, this PDF from the Biblical Language Center is for you. Reconstructed Koine NT Recordings: The only recordings I’ve found are of the Gospel of John and the Epistles of John. They are available for purchase at the Biblical Language Center store, although here is several free sample recordings they provide as well. I would consider the lack of lengthy audio recordings a real weakness, especially if you want to listen to long portions of the NT in Koine Greek. Modern Pronunciation Basics: This page by Harry Foundalis offers a great explanation of modern Greek pronunciation, with audio recordings for each letter. Modern NT Recordings: Spiros Zodhiates, a native Greek speaker born in Cyprus, recorded the entire NT, which is available for purchase online. It claims to follow the Nestle-Aland text (26th edition), although I haven’t verified that. Zodhiates speaks at a slower pace compared to the typical faster clip of a native speaker, which helps comprehension. An alternative recording of the entire NT can be downloaded through Faith Comes by Hearing. For language, select Greek. You then will have two options, choose the Ancient 1904 Patriarchal Text. This is a recording of the same Greek NT that the Greek Orthodox Church uses, which is based on the Byzantine textform. The NT is read at a much faster pace on this recording. I would recommend buying Zodhiates’ recording first, and only listen to the Patriarchal Text recording after you can comprehend the NT well at the slower reading speed. If you haven’t read them already, check out my other posts to help you read the New Testament in its original language. What Greek New Testament Should I Get? Memorizing vocabulary is essential if you want to develop proficient reading ability in the Greek New Testament. No matter how well you know the Greek morphology and syntax, you will never be able to quickly read through the New Testament unless you know what the words mean. It’s as simple as that. You’ll spend all your time looking up words in a Greek lexicon. Even with Bible software, this is a time-consuming process. Here’s some advice. Make sure you actually enjoy reading your Greek New Testament by spending time upfront committing the vocab to memory. Once you get down the basics of pronunciation, you can begin learning vocab words. Although it takes time and discipline, learning the vocabulary is one of the most controllable aspects of learning Biblical Greek. It is controllable, because anyone can do it with daily study. You’re in the driver seat. As you learn more words, the language comes alive and reading your Greek New Testament becomes quite enjoyable. Since the goal is to help you read the Greek New Testament, we can be very strategic in how we approach what words to memorize. Of 138,607 total words in the Greek New Testament (don’t panic), there are roughly 5,394 total unique words. Of these unique words, the vast majority of them only occur a few times, while some occur hundreds of times. The key to memorizing vocabulary is beginning with the most frequent words first, and only then moving on to the less frequent words. Eventually, you’ll be able to recognize enough words that you can infer the meaning of the remaining based on the context. Here’s the breakdown. 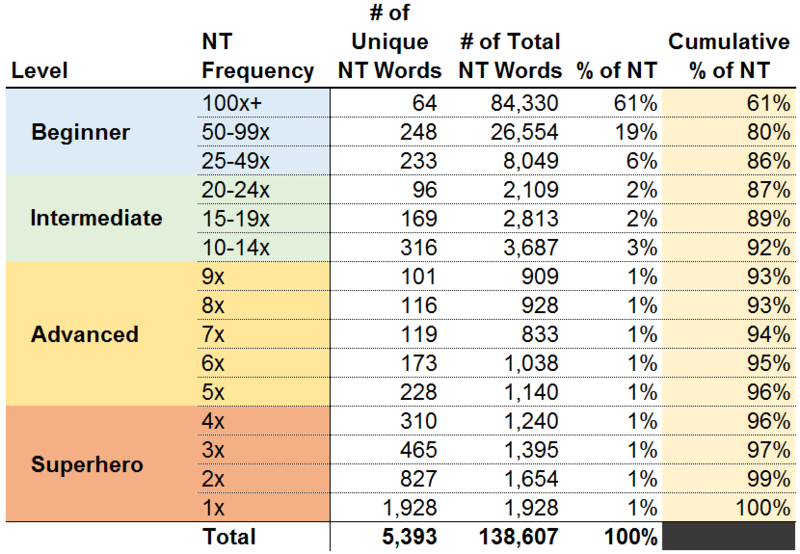 This chart tells us, for example, that a total of 64 words occur 100 times or more in the NT. Altogether, these unique 64 words account for 84,330 total words in the NT, or 61% of the NT. If you memorize down to 10x, you’ll know 92% of the NT. If you want be competent at reading the NT, I suggest trying to memorize through words that occur at least 10 times (a total of 1,126 words). To start, a good initial beginning goal is through 25x frequency (545 words). This is a lot compared to what you’re required to do in most beginning Greek classes, but it’s foundational to developing a basic reading ability. To truly feel comfortable and proficient reading the NT, I would suggest memorizing through 5x frequency (1,863 words), which will cover roughly 96% of all word occurrences in the NT. This threshold will allow you to infer the meaning of many unknown words you come across based purely on the context. If at all possible, review your vocabulary words every day. Try to memorize new words every week, while consistently maintaining your previously memorized words. An attainable goal is 25 words per week. If you’re really ambitious, go for 50 words a week. That’s 10 words per day with a weekend break for just review. Again, the key here is consistency. You do not need to “memorize” so many words that you immediately forget them all. The hardest words to memorize are the very first words. Many of the most frequent words you’ll first study are those little abstract words like conjunctions, prepositions, articles, and so forth. Not only this, but you haven’t become proficient in pronunciation, which only makes things even more difficult. Despite this initial pain, don’t give up. Your brain will adapt. The more words you memorize, the easier it’ll become. When you have several hundred words under your belt, you’ll start to recognize common prefixes and roots. You’ll be able to memorize and retain words much easier, so keep at it. Now that you understand the process, you’ll need to either buy or make your own cards. I recommend you buy a set of NT Greek flashcards for the first 1,000 words, and then create your own flashcards for the remainder words with lower frequency. There are two flashcard packs available for purchase that I am aware of, Basics of Biblical Greek Vocabulary Set by Zondervan and Biblical Greek Vocabulary Cards by VIS Ed. I would suggest the Zondervan set, as it has more features, such as providing the principal parts for verbs. Bill Mounce has a free computer program on his website called Flashworks that has 1,127 of the most frequent NT Greek vocab words for review (it also has a Hebrew vocab list). This will allow you to drill vocab on your computer, or simply get your feet wet before you decide to buy a vocab pack. If you want to memorize more than 1,000 words, you’ll have to make your own or use a computer program. If you want to make your own flash cards, download this handy Excel list of all Greek NT vocab words with their corresponding frequency (vocab list based on a free Excel vocab program available here). Just filter on the particular frequency you want to memorize, and you have all the words you need with their definitions. Buy some card stock, and start making your own cards by hand. If you’re interested in just using software/online program to memorize, here’s an online option. Alternatively, this downloadable Excel file has built-in vocabulary program with vocab words from the entire NT. Regardless of what tools you use, learning NT Greek vocab is completely manageable. There’s no magic formula, you just have to start doing it. Of course, if you want to read the New Testament, you can’t limit yourself to memorizing vocabulary. The words really stick in your mind when you begin to attempt reading through the New Testament. Instead, of just having random definitions in your mind, you’ll understand how the words are used in context. This, of course, will only reinforce you vocabulary acquisition. Hope this post is helpful to you. If you have any questions, feel free to comment below and I’ll help you out as best I can. Now that you understand the ins and outs of learning NT Greek vocabulary, why don’t you check out my other posts to help you read the New Testament in its original language? Teach Yourself Biblical Greek: What Greek New Testament Should I Get? You’ve decided to start studying Biblical (Koine) Greek. You know the Biblical Greek grammar options, and now you need your own Greek New Testament. If you search Amazon, you’ll see a number of different versions. Which one should you choose? I’ll give you all the information you need to make an informed decision. The first Greek New Testament I bought was a scholarly version of the Byzantine/Majority textform. While a great resource (one I’m glad I purchased even though I didn’t know what it was at the time), it didn’t match my Greek New Testament audio files which were based on the Nestle-Aland 26th edition. I was quite confused. I didn’t understand what the difference was and what GNT I needed. You may be just as confused as I was after reading this paragraph. Well don’t worry, read on, and I’ll guide you through the different Greek New Testaments you can purchase or view online for free. Before I list our options, some background information is necessary. Most Greek New Testaments available today are what we call eclectic or critical texts. This is a text that is based off of comparing many different ancient manuscripts of the New Testament. Scholars compare the biblical manuscripts and use their best judgement (and agreed upon scholarly criteria) to recreate what they feel is the closest readings to the original New Testament text. This discipline as a whole is known as textual criticism. Besides these eclectic texts, other editions of the Greek New Testaments are often based off of what is called the Byzantine textform. This would include scholarly editions of the Byzantine/Majority textform, the Greek Orthodox Patriarchal text, and the well-known Textus Receptus. I’ve included links to the Byzantine/Majority and the Patriarchal Greek text below if you’re curious. With that said, here are the most common Greek New Testaments available today. At the end of the post, I’ve also given my personal recommendation for a beginning student. The UBS editions are eclectic texts, as we mentioned above. These editions match the readings in the Nestle-Aland editions (see below). The primary differences between the two are found in the formatting and the apparatus (footnotes that show the manuscript variations). A complete technical comparison is given here on the German Bible Society’s website. Here’s a more visual comparison that’s also helpful. The most recently published UBS edition is the fifth edition (UBS5), although you can still easily find new and used copies of UBS4 online. UBS5: This is your standard copy of the UBS fifth edition. You can find a couple different covers, but the content is all the same. The NT is entirely in Koine Greek. The Greek-English New Testament: UBS 5th Revised Edition and NIV: Includes the NIV English translation on one page, with the Greek text on the other. Once you start being able to read your GNT, it is helpful to have an English translation when you’re in a bible-study or church service. This allows you to read the Greek, but still have the English translation readily available without flipping between two different Bibles. The Reader’s Edition: The Greek New Testament (UBS5): I would highly recommend this edition for beginning students. The Reader’s Edition offers the standard UBS text, but with definitions for words that occur less than 30 times on the bottom of each page. Here’s a PDF sample from Matthew. Verbs are parsed, which is a good check as you read. The font is large and legible, and the formatting is excellent. The definitions are short-glosses, so I would only use the definitions as an aid. To see the full range of possible meanings, you’ll need to use a proper lexicon. As stated above, the text of the Nestle-Aland editions match the UBS editions. Read the UBS section above for more details regarding these differences. The most recently published edition is the Nestle-Aland 28th Edition (NA28). Between the older 27th Edition (NA27) and the NA28, only the text for Catholic Epistles (non-Pauline epistles) have been updated, and those updates are minor at that. (See here for more info). For pure reading purposes, a used copy of the NA27 will work just fine. NA28: The most compact format with just the Greek text. NA28 with Dictionary: Same as the standard NA28, but includes a compact dictionary at the end. NA28 Greek-English: Offers the Greek text with two English translations, the New Revised Standard Version (NRSV) and the Common English Bible (CEB). Due to the added translations, it’s double the thickness of the standard NA28, but still portable. The Greek New Testament for Beginning Readers: This is a reader’s that uses the Byzantine Textform. As a reader’s GNT goes, it has some excellent definitions for words that occur 50 times or less. Another nice feature is that the definitions include the word’s frequency in the NT. However, It is a bit bulky and the binding isn’t high-quality. But if you only plan on using it at home, it is a good resource for a student with minimal vocabulary knowledge. A Reader’s Greek New Testament: Third Edition: What differentiates this reader’s GNT apart from others is that it uses Greek text underlying the NIV. Footnotes provide differences with UBS5/NA28. You should also beware that this reader’s does not include parsing information for verbs. Only definitions are provided, which I think is a weakness, especially for a beginning student. If I’ve confused you with all these options, here’s what I recommend for a beginning student. Nestle-Aland Novum Testamentum Graece 28th Edition (NA28): This is not immediately necessary, but if you plan on seriously learning biblical Greek, you’ll need this at some point. Now that you are informed about Greek New Testaments, why don’t you check out my other posts written to help you read the New Testament in its original language? You’ve decided to teach yourself Biblical Greek and now you need to purchase an introductory grammar. To kick-start your search, I’ve summarized some of the more well-known textbooks below for you. I’ve even included several grammars you can download or view online for free. You can teach yourself from all of these texts, there’s no right or wrong grammar. In fact, if you’re serious about learning, it may be helpful to have a couple grammars to compare and contrast from as you learn. A good grammar is indispensable as you study Biblical Greek. In order to read the New Testament in its original language, you’ll have to identify many different forms of words to understand their full meaning. The only way to learn the forms is to study them. Knowing vocabulary will only get you so far, so you need a grammar. There’s no way around it. This is one of the most well-known introductory grammars out there. The strength of this grammar is found in the supporting materials. William Mounce’s website, billmounce.com, includes a variety of supplemental resources available for purchase that go along with the grammar, including a complimentary workbook, flashcards, and video lectures. I started out with this grammar, and it has everything you would need. That said, I found that while it did a good job of explaining the concepts, it didn’t help me bridge the gap to actually reading the New Testament in Greek. Within the textbook, there are not many practice examples to apply the concepts you learn. I suspect the corresponding workbook is needed to supply the additional practice needed to really understand and apply the grammar. As evidenced by the title, this grammar combines both a practical introduction to Koine Greek and an ‘integrated workbook.’ By ‘workbook,’ I believe they mean that it offers plenty of practice examples that have been included at the end of each chapter. The book is really designed to help you read the New Testament. Each chapter has thorough explanations, which is great if you don’t have a professor to explain the concepts. A short reading passage is included at the end of the chapter for practice. The examples included throughout are straight from scripture (both the New Testament and Septuagint), rather than being made-up sentences. This is a fairly thick book at 672 pages, but when you’re learning on your own, more content is not a bad thing. Here’s the first chapter online for free. I am biased since this was my primary introductory grammar, but I would definitely recommend this book if you’re going the self-taught route. Dave Black is a great communicator, so it’s no surprise that his grammar is one of the more popular options. I have never used this book, but it looks to be a solid grammar. I’m sure it’s used often in seminary classes. I’ve read his intermediate grammar, and Dave excels at explaining intimidating concepts in a clear and concise manner. Dave has a whole slew of resources available for his grammar on his website, which is worth checking out regardless of what textbook you buy. This is another well-received introduction to New Testament Greek. I believe it is a paperback, which could be a problem since a grammar is the type of book you’ll be using a lot. That said, you can pick a used copy on Amazon quite inexpensively. Available online for this textbook includes some supplementary material from the publisher, a vocabulary reference chart, and free notes. Now that you know about your options for Biblical Greek grammars, why don’t you check out my other posts that give some helpful tips to help you read the New Testament in its original language? If you want to learn to read your New Testament in its original language, Koine Greek, this post is for you. The most difficult aspect of learning something new, is you don’t know what you don’t know. You end up learning the hard way, as with most things in life. Learning biblical Greek is no different. My goal here is to share some advice and hopefully ease some of your pain as you begin your studies. The focus is going to be on learning to read the Bible, primarily the Greek New Testament, but it also will help reading the ancient Greek translation of the Old Testament (known as Septuagint or LXX). As you grow in knowledge, you will be able to analyze the Greek more closely for exegetical study, but for now I just want to get you reading at a basic level. First of all, I am self-taught when it comes to biblical Greek. Consequently, my advice is specifically geared towards those who want to learn and aren’t able to take actual classes. Fortunately, there has never been a more advantageous time to teach yourself. We have a world of information at our fingertips, the only thing that is stopping most of us from learning is plain old hard work and discipline. For more information: What Greek New Testament Should I Get? 1. Learn the Greek alphabet. You need to be able to recite and write the entire alphabet from memory. Just as importantly, you need to become intimately familiar with the sounds the letters make. All you need for this stage is your grammar, and perhaps audio files of the alphabet being pronounced. 2. Practice proper pronunciation. If you know the alphabet and how to pronounce each letter, you’re off to a good start. Now you must begin sight reading words. Your grammar should explain the various pronunciation systems to choose from. You’ll want to decide up front what pronunciation system to use, and keep that consistent as you learn. In addition to the individual letters, you’ll also need to learn the sounds that diphthongs make (this is when two vowels are combined). The pronunciation of the diphthongs will differ depending on what pronunciation style you’re using. If you’ve found an GNT audio recording, listen to a verse, pause, and then read the same passage out loud to yourself. Don’t worry about not understanding what you’re reading at this point. You need to internalize the sounds of the language. Once you get comfortable with this, begin reading several verses out loud without the help of the audio recording. After you read a verse or two, listen to the audio recording to check your pronunciation. When you’re driving around town, play the recordings to further reinforce the pronunciation. 3. Develop a solid vocabulary base. Now that you can actually recognize letters and pronounce words, you need to solidify this knowledge. A good way to practice is to memorize vocabulary. You’ll want to use your Greek New Testament flashcards, starting with the most common words occurring in the NT. Focus on memorizing small increments, let’s say ten at a time. At first, it will be difficult, but the more you memorize, the easier it will become. You’re brain will adapt and you’ll be able to memorize much quicker. Spend some time every day at this. It’s about consistency, not just memorizing 100 words that you immediately forget. 4. Begin learning the basics of Koine Greek grammar. As you memorize vocabulary words, you’ll want to begin working your way through the grammar. At first it will be daunting. There will seem to be a lot to learn. Don’t worry. Master the basics and review hard portions repeatedly over the course of weeks or months. It will start to sink in. If you find yourself overwhelmed, keep reinforcing the pronunciation and vocabulary. Until you see Greek words as actual pronounceable words and not a bunch of random symbols, you won’t be able to learn the intricacies of the grammar. You’ll probably want to begin with nouns, learning the different cases and their endings. The basic verb forms are not a bad idea either. Grammars break down the concepts well in an organized manner, so I’m not going to tell you what to study here. Just read your grammar and decide what makes sense for you. 5. Read easy portions in the Greek New Testament. As you progress with the steps listed above, you’ll want to begin attempting to read from your Greek New Testament. I would suggest with starting with one of the easier books, such as 1 John or the gospel of John. Attempt to read a paragraph or two. Once you’ve given it your best shot, lookup the verses you struggled with in a Greek-English interlinear, or in your English bible. The point is you need to be working out your brain by consistently trying to read a portion of the NT. Try to get to at least one chapter per day. You don’t need to understand every grammatical nuance, but strive for general comprehension. As you learn, you will be able to fill in the knowledge gaps. 6. Continue to memorize vocabulary, study your grammar, and read the Greek New Testament every single day. The key is consistency. You need to be reviewing vocab words already memorized, and learning new words as you’re able. Every day open up your Greek NT and read something. The only way to really learn to read is to just do it, even if it’s hard. Aim to get up to a chapter a day. As you attempt to read, you’ll realize you don’t know everything you need to know and you’ll be motivated to study the particulars of the grammar. And the grammar you learn will make your reading easier. And so it becomes a self-reinforcing cycle. This is the method I took, but each person have their own learning style. Feel free to change up how you approach learning to best fit your personality. Some people love memorizing grammar rules. If that’s you, go for it. You need to assess how you learn best, and then apply that to learning Greek. Regardless of your approach, you need to be determined, disciplined, consistent, and willing to work hard. There will be times when you get frustrated. Don’t worry, keep studying. Your work will begin to pay off, and the rewards will begin to overcome the pain. As you begin to see the light at the end of the tunnel, the joys of Koine Greek will become more evident and you’ll want to keep learning. If you have to the motivation and discipline, you can be reading at a basic level the Greek New Testament in under a year’s time. So go for it! Now that you know how to begin teaching yourself Biblical Greek, why don’t you check out my other posts that give some helpful tips to help you read the New Testament in its original language.